Experts in Site Assessment and Species-Specific Solutions! In March 1998, there was no “chemical aerosol bird control”. Rejexit Migrate (then “Ag 36”) had been on the market for several years, but fogging was still unproven, and not labeled by the EPA. That was my first fogging job: experimenting so that fogging would be approved by the US EPA- and it was October 16, 1998. Besides developing many of the procedures for manual fogging, FF USA formed the basic constructs for automatic fogging systems and in 2002, the “Bottle Blaster” set the standard. The first half of the 2000’s saw huge upswings in nuisance bird control services as most regional and national pest control companies started to sell and implement (often haphazardly) bird control. Most of these companies relied on exclusion and began selling bird exclusion materials. Large jobs priced in the $100,000’s were common. The technology of noise aversion also expanded significantly in direction and complexity. Nevertheless, all the new products had limits like the old products, and most times, it proved ineffective in the long-term. There has always been, and will be lethal control in nuisance bird services. This avenue, however, went to extremes. Unknowing, uncaring or unscrupulous contractor-treated food laced with poisons struck birds by the thousands; sometimes 10’s of thousands fell dead out of the sky. For us, more influential than any business activity was the economic downturn in 2007-08. Within 2 years, over 50% of the companies doing bird work had failed. Nearly all regional and national pest control companies had reduced or suspended operations. Flock Fighters USA was hurt as well, but we continued to serve as we were able. Now, in 2012 and 2013, the consequences of not controlling nuisance birds and problem areas in a routine manner have come to bear with excessive manure and mess created by 4 years of uncontrolled nuisance birds. Nuisance bird aversion has once again become an imperative and Flock Fighters USA is placed on the cusp of the new revival. Our experience and expertise is once again helping us to lead the way in aversion strategies and solutions. We’re looking toward new delivery technologies for MA that will deliver the advantages of this chemistry in more effective ways. However, the change in bird control is not a silver bullet… there’s never been a silver bullet and there never will be one. What has come out of the past several years is that the bird control professionals that have continued in the field are the ones with the passion and knowledge to create exciting solutions. They’re the ones who understand site dynamics and bird behavior in a way that others never did. These are the people who will continue to work toward new technology and we’re proud to work with professionals like these. Keep an eye on our blog, because we’ll let you know as science continues to advance… and, as always, if you have questions about your site or species of bird, contact us! We will design a solution just for you! Okay, maybe not in quality, but certainly in quantity of birds! Thanks to Mandy Cherifi of Fort Wayne, IN, for providing this video. She says she and her family saw this enormous flock near a local ice cream shop. The birds you see in this video are Starlings, Sturnus vulgaris, and they are winter’s #1 nuisance bird in the eastern half of America. This non-native species forms winter flocks which can number in the millions! They create massive problems for cities, parks, industrial sites and farms. Behavior such as what you see in the video is common for this time of year, and while it’s entertaining to watch at the ice cream shop, the consequences of large flocks upon business and manufacturing centers can be devastating (you can read our previous post for more details)! The aversion product most often used against starlings is pyrotechnics – usually with marginal results. 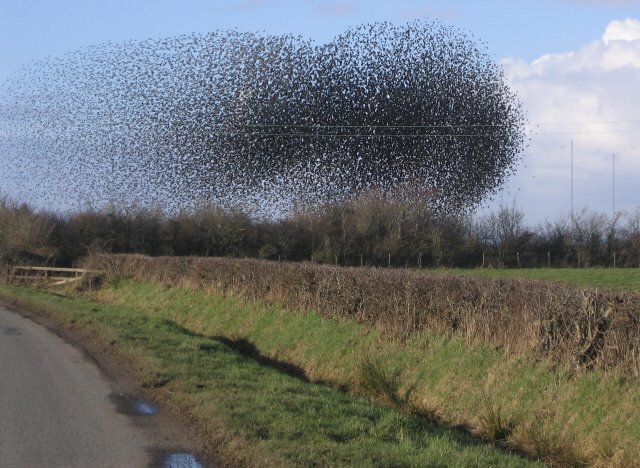 While the birds react, the starlings learn that the aversion activity has no personal affect and they become resistant. Starlings cannot see to fly at night. Therefore, nighttime applications are not effective. Aerosols should be applied within the last hour of daylight (when the majority of birds have just arrived to the roosting site). Greater efficacy is achieved in dusk applications due to the evacuated birds being forced to find a new location before nightfall. This reinforces the new behavioral pattern and the “new home”. Starlings have a home range of about 10-20 miles, but they can migrate hundreds of miles in the winter. It’s hot now, but fall and winter are fast approaching. Often, as I sit shivering near the fireplace, I think, “What happened to summer when I was complaining about the heat?” It seems like we just forget that the weather changes so quickly in many areas of the country. This year, I’m working to think and plan ahead for the upcoming winter months: gathering firewood, prepping meals and going through the kids’ winter clothing. Whether they’re migratory or not, birds have seasonal behaviors, too. The fact of the matter is this: the same features of your property that attract humans also will attract birds. Man-made environments create ideal spots for birds to roost, feed and nest. If you had birds on your property last year, odds are you’ll not only have those birds this year, but you’ll also have the fledglings that were born over the summer months. Flocks of birds like starlings and grackles can reach astounding sizes (numbering into the millions!). While immense flocks of starlings may be awe-inspiring to look at, masses of any kind of bird create big problems for property owners and site managers. Nesting birds create hazards with their bodies and flammable nesting material. Some birds, like Canada geese can become extremely aggressive, while other properties deal with other unpleasant issues: the ‘poo factor’. Bird droppings create problems even further than just the unsightliness of the droppings. Bird droppings are corrosive, damaging equipment and catwalks. They become extremely slippery when wet, and are known vectors for many diseases and parasitic infections. Droppings can foul inventory and raw materials when birds nest in manufacturing areas and warehouses. Winter is coming and roosting, feeding, nesting birds are coming with it. What do you do? We’ll talk more about that in future postings, but for now, rest assured that Flock Fighters USA has you covered. You can contact us, and we’ll put together a specific plan, tailored for your site. Your site CAN be bird free: effectively and efficiently. Flock Fighters USA has arrived on the blogging scene! We’re excited to be able to converse with our clients in a new way and we’re looking forward to connecting with people, as well. Flock Fighters USA is based in Fort Wayne, Indiana, and works with homeowners and companies locally, nationally and around the world to rid all kinds of sites of nuisance birds. We pride ourselves in our ability to accurately assess all bird problems and implement solutions applicable to the site and species of bird. No site is too large or too small. If you want to do the work yourself, Flock Fighters USA can train your staff or local PCO and provide them with the right product and machinery to make you successful. If you’ve never heard of Flock Fighters USA, you can visit our website or take a look at our corporate brochure. If you have questions, you can contact us anytime! Brochures Media to View Thoughts from Jeff Videos Who are We and What Do we Do?